“The Camino Voyage”; a film, described by the Dingle Film Festival as “Enchanting, Inspiring and ultimately very deeply moving”, will be shown in its entirety to an assembled audience at Cabragh Wetlands on Thursday next, March 28th, at 7.30pm. A large crowd is expected to be in attendance with an opportunity to meet film directer Mr Dónal Ó Céilleachair, latter who will answer questions regarding all aspects of the making of this unhurried, epic and soulful film. The Camino Voyage Press Clip 6: ‘Leave a Light’ from Anú Pictures on Vimeo. This truly heart warming, spirited documentary film tells the true story of a Writer, two Musicians, an Artist and a Stonemason, who embark on an inspiring, yet dangerous 2,500 km (some 1554 miles), journeying by sea, in a traditional boat (a currach / naomhóg) that they built themselves; rowing all the way from Ireland to Northern Spain. Four men; poet Danny Sheehy, artist Liam Holden, musician Brendan Begley and stonemason Breandán Moriarty, set out on this journey, in three yearly stages, beginning in 2014. Musician and Academy Award winner Glen Hansard replaced Breandán Moriarty on the final leg, introducing new acquaintances to Irish song and merriment. The very real dangers that attend such voyages were confirmed when last year, poet Danny Sheehy died when the currach / naomhóg capsized off the coast of Portugal; the film now remaining as his memorial. Released to selected Cinemas across Ireland for just 9 weeks, this film has won numerous awards; including two “Audience Awards” from the Dingle International Film Festival and the Luxembourg British & Irish Film Season, and two “Documentary Awards” from Irish Screen America Film Festival NYC and An tOireachtas Media Awards, 2018. Thurles resident Mr Michael Walsh [Latter who undertook the same journey on foot in 2013] and his son Ben, are both acquainted with the boats crew members and the film makers, and both confirm that this event is a major coup for Cabragh Wetlands. They are encouraging as many people as possible to attend on Thursday night. Note: A suggested contribution for this major event is just €5, with full proceeds donated, going directly to the Cabragh Wetland Development Trust. ” You’re doing a lot of yawning, you must be tired”, said I to Mikey Ryan. We were both above in the Arch Bar, in Liberty Square last Thursday night; our mission to break one or two open and quench our uncontrollable thirst. “Sure nowadays, what with all this gender equality, yawning is about the only time a married man ever gets to open his mouth”, replied Mikey grinning. “No really I think it has something to do with this unusual sultry weather”, he continued, “sure if this keeps up, come next Lent, Thurles will feature on the front of the new Trocaire Box”. “I cod you not Mikey” said I, “but out around Ballinahow, Borrisoleigh and the Two-Mile-Borris areas of Thurles, the cows are giving evaporated milk; farmers are feeding their hens on crushed ice to keep them from laying hard-boiled eggs, while the larger trees are actually whistling for dogs. “They probably have all gone off to Dublin like our young people, following the jobs trail”, said I, “sure there is nothing to be found anywhere for anyone in this God forsaken rural wasteland. But come to think of it I haven’t seen you around in several weeks either”, said I, “sure I thought you had emigrated”. “Truth is”, said Mikey “wasn’t the wife one of the 20 lucky winners of half a million on the Euro Millions Lotto Jackpot recently here in Thurles, not that her win greatly benefited my bank balance. But Frau Ryan decided to take myself, her mother-in-law and our brats to Tanzania in South Africa, of all places, on a Wildlife Safari. But I hasten to add, it would have been better had I stayed at home”. “What happened, did you get left stranded by the recent Ryanair strike”, said I. “Oh, now it’s a long story”, said Mikey, “but I’ll give you the guts of it. Last Sunday night, while we were sleeping deep in the Tanzanian wilderness, didn’t Frau Ryan, my lesser half, wake up to find her mother had wandered off. Rushing into my tent next door, she insisted on me getting up and going outside to try to locate the doddery ‘auld wagon’. In an attempt just to keep the peace, I picked up my Ruger, over and under shotgun, that she had bought me for the trip; took a swig of whiskey from my discreet, leather encased, silver hip flask, and beckoned her to follow me”. Mikey continued, “A couple of minutes later, there in a clearing, not 100 metres from our camp-site, I came upon the most chilling of sights. 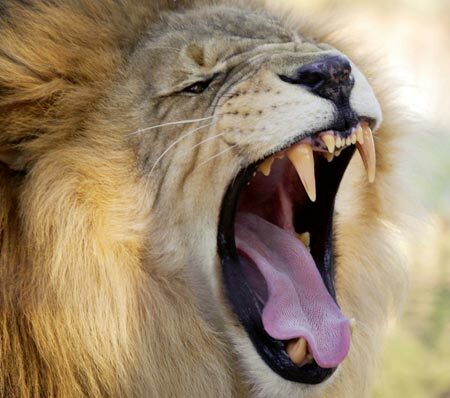 Imagine the scene yourself; there was my mother-in-law with her fat arse up against a thick Baobab tree, and standing in front of her was a large, snarling, mangy looking lion”. It is estimated that 200 million cars being driven in America, with each vehicle driven an average of 20116.8 kilometres (12,500 miles) each year. The entire nation therefore travels approximately 2.5 trillion miles annually, and will kill off an estimated 32.5 trillion insects in this travelling process. Here in North Co. Tipperary Ireland, cars, particularly those black in colour, don’t have to travel at all, to kill our insect life. Due to unprecedented sunshine raising our heat levels, (averaging between 27° and 30°), millions of insects. who choose to land on black car windscreens, are being tricked into committing suicide. Dark colours absorb heat, most especially that from the sun’s rays; while light colours reflect about 60% of this same sunlight. Less than 10 years ago the state of California in the USA, actually considered banning the sale of new black cars. Had this rule been introduced, same would have translated to a 2% decrease in fuel economy savings, due to a related decrease in air conditioner use, thus in turn further reducing carbon dioxide emissions by 1.9%. 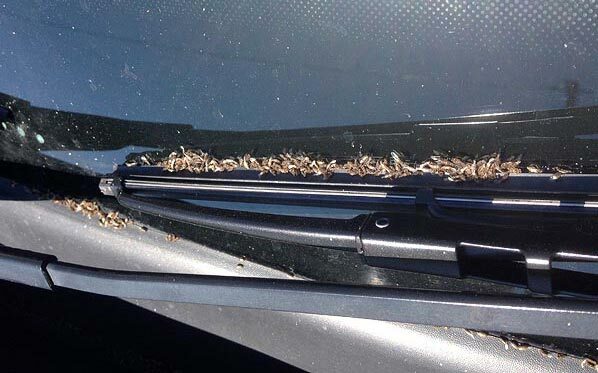 So far as I am aware the forced mass suicide of insects was not considered; however here at home, do check your car windscreens to avoid your car’s fan system sucking these dried, fried insect into your vehicle. Is This What They Label As “Fake News”? A new €2million initiative has been launched in an effort to boost tourism across ‘Ireland’s Hidden Heartlands’ region, with a promise of further funding to follow this initial €2m allocation. ‘Ireland’s Hidden Heartlands’ is the latest brand to be launched by Fáilte Ireland following their ‘Wild Atlantic Way’ and even less convincing ‘Ireland’s Ancient East’. This ‘Ireland’s Hidden Heartlands’ promotion will covers parts of Leitrim, Roscommon, East Galway, East Clare, North Tipperary, Offaly, Westmeath, Longford and Cavan. Same, we are informed will encourage tourism through the promotion of walking, cycling and boating, as well as fishing and other activities in and around towns and villages within the region. A series of food networks and trails will also be developed; with the flood prone River Shannon marketed together with Waterways Ireland to encourage tourism both on and off the river. Today was obviously a slow news day everywhere; with national and local TV, Radio, Press and social media outlets, all grabbing the “Fake News” for their various publications. Sounds great, but it would appear that Fáilte Ireland’s members; their CEO Mr Paul Kelly and Mr Paul Keeley (Director of Commercial Development), apparently just don’t get “out and about”, much, anymore. While they have been sweating; involved “in months of extensive market testing”; gleaned they claim both from here (I can’t find one person contacted in North Tipperary, in relation to this new branding) and overseas, it would appear that most of the gathered information came from tourists abroad, and from persons who have never driven on Ireland’s secondary road surfaces. 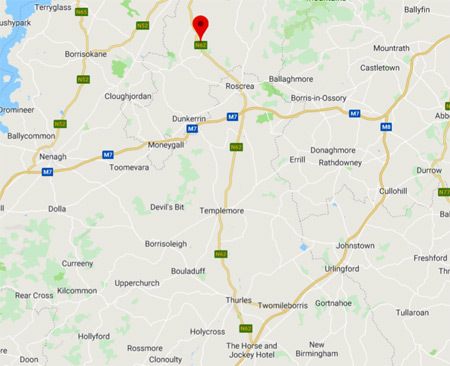 Keep in mind that this new initiative, which has little for North Tipperary natives to get into a bee-like frenzy about, is expected to tap into that “off the beaten track” experience. But perhaps the biggest chuckle, is that this new ‘Ireland’s Hidden Heartlands’ brand was officially launched by Mr Shane Ross, Minister for Transport, Tourism and Sport who sped down the M4 & M6 motorways for an announcement ceremony in Athlone, Co. Westmeath. (Home of Mr Kevin “Boxer” Moran). 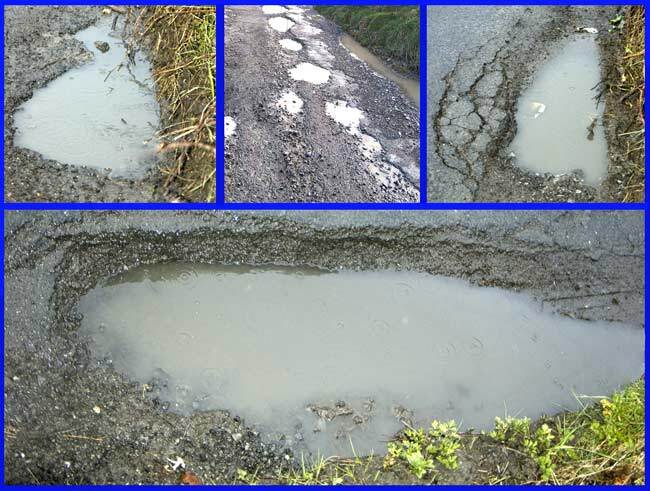 No, Mr Moran and Mr Ross made no mention of structural failures on off-motorway road surfaces, caused by flood water in the underlying soil structures; as they gazed grinning from behind a cardboard cut-out. Why does my late grandmother’s dissenting description now echo and spring to mind; “Asses looking over a whitewashed wall”.